Murray, G. (2014). The social dimensions of learner autonomy and self-regulated learning. Studies in Self-Access Learning Journal, 5(4), 320-341. This paper examines how learner autonomy and self-regulated learning might be related by comparing and contrasting the two constructs. After identifying the traits learner autonomy and self-regulated learning have in common, I argue that in order to understand how they differ we have to look beyond a discrete point comparison of their features. Given that both areas of inquiry have been broadening their focus on the individual learner to include greater recognition of the role of the social environment in the learning process, I expand the scope of my analysis to include their social dimensions. In the ensuing discussion, I explore the notion that their social dimensions encompass emotional, spatial and political dimensions. To illustrate my points, I draw on data from an ethnographic inquiry investigating the experiences of Japanese English foreign language learners participating in a social language learning space on the campus of a large national university. The paper concludes by examining the implications of this theoretical discussion for pedagogical practice and further inquiry. In the literature on learner autonomy in language learning it is not uncommon to see references to self-regulated learning. These references suggest a tendency to conflate the two constructs. This is not surprising given that on the surface learner autonomy and self-regulated learning appear to be similar in as much as both emphasize learner control and metacognition. Nonetheless, they remain two separate areas of inquiry. What is surprising, given their shared interests, is the lack of attempts to examine how the two might be related, how they differ, and how research in one area might inform work in the other (for exceptions, Lewis & Vialleton, 2011; Loyens, Magda, & Rikers, 2008). The principal aim of this paper is to examine how learner autonomy and self-regulated learning might be related by comparing and contrasting the two constructs. In doing so, it will be demonstrated that in order to understand how these two constructs differ, we have to look beyond a discrete point comparison of their features. Over the past twenty years, work in both areas of inquiry has gradually broadened the focus on the individual learner to include increased recognition of the importance of the social context and interaction in the learning process. In this paper, I argue that in order to understand the relationship between learner autonomy and self-regulated learning, we need to expand the scope of our analysis to include their social dimensions. Therefore, I will look at three questions: 1) In what ways are learner autonomy and self-regulated learning similar or different? 2) What are the social dimensions of learner autonomy and self-regulated learning? 3) What are the implications for pedagogical practice and research in both areas? To illustrate various points in the discussion, the paper draws on data from an ethnographic study investigating the experiences of Japanese English foreign language learners participating in a social learning space on the campus of a large national university (Murray & Fujishima, 2013; Murray, Fujishima, & Uzuka, 2014). Rather than provide definitive answers, the intent is to open up a discussion of these questions, to draw attention to related issues, and to explore directions for future research and pedagogical innovation. In order to understand the relationship between learner autonomy and self-regulated learning, I begin by looking at key definitions of the constructs. Holec (1981) provided the area of learner autonomy in language learning with its seminal definition, “the ability to take charge of one’s learning” (p. 3). For Holec, this meant assuming responsibility for all aspects of the learning process, including setting goals, selecting materials, deciding on activities and strategies, monitoring progress and assessing outcomes. More recently, Benson (2011) has modified Holec’s definition to read “the capacity to take control of one’s own learning” (p. 58), contending that the construct of “control” is more amenable to empirical investigation than “to take charge”. Perhaps an equivalent seminal definition in the area of self-regulated learning is Zimmerman’s (1989) description of the self-regulated learner: “Students can be described as self-regulated to the degree that they are metacognitively, motivationally, and behaviorally active participants in their own learning process” (p. 329). Pintrich (2000) offers insight into what it means to be an active participant in one’s own learning when he writes that in academic contexts self-regulation can be understood as a “process whereby learners set goals for their learning and then attempt to monitor, regulate, and control their cognition, motivation, and behavior, guided and constrained by their goals and the contextual features in the environment” (p. 453). From these definitions, one can identify several features that the two constructs seem to have in common, such as concerns with goal-setting, monitoring learning, and control. Few attempts have been made to compare learner autonomy and self-regulated learning. Two notable exceptions are Lewis and Vialleton (2011) and Loyens et al. (2008); in the case of the latter the comparison was with self-regulated learning (SRL) and self-directed learning (SDL). SDL can be viewed as a manifestation of learner autonomy in which learners accept responsibility for all the decisions related to their learning (Dickinson, 1987), such as those pertaining to setting goals, selecting materials, determining strategies and activities, monitoring and assessing their learning. As one would suspect, Loyens et al. (2008) concluded that “SDL and SRL have similarities with respect to active engagement, goal-directed behavior, metacognitive skills, and intrinsic motivation” (p. 423). Despite these similarities, they note that the two terms cannot be used interchangeably. Although learner autonomy and self-regulated learning share several key features, they differ over issues pertaining to learner control of the learning context. As Table 1 illustrates, the general consensus in the literature is that active engagement and goal-directed learning are features of both learner autonomy and self-regulated learning. The definitions provided earlier make it quite clear that the development and application of metacognitive skills is a key facet of both – learners need to be able to plan, monitor and assess their learning. Similarly, intrinsic motivation figures prominently in both (cf. Ryan & Deci, 2006; Ushioda, 2007). In addition, self-regulation and autonomy are viewed as learner characteristics; learners can be characterized as being autonomous and self-regulated. However, beyond this point, a comparison of the two constructs starts to become strained (as indicated by the question marks in Table 1). The differences between learner autonomy and self-regulation start to become apparent when we shift our attention to the learning environment. For example, autonomy can be viewed as a design feature of the learning environment (for a discussion see Benson, 2008). Certain courses are designed in such a way that learners have control over managing their learning and the selection of content (Benson, 2011), which has implications for the pedagogical design as well as the physical design of the learning environment. In contrast, “the extent to which self-regulation resides in the person or in the activity of the person underlies considerable conceptual divergence in the literature on self-regulation” (Martin & McLellan, 2008, p. 436). In regard to learner initiation of the learning task, in SRL there seems to be a general tendency for the teacher to set the learning task and within those parameters students have varying degrees of freedom to select learning strategies and engage in SRL activities. On the other hand, in the area of learner autonomy in accordance with Holec’s (1981) model, learners are expected to assume responsibility for determining the learning task. Yet Littlewood’s (1999) distinction between proactive autonomy and reactive autonomy weakens this point of comparison. Whereas proactive autonomy reflects Holec’s model, reactive autonomy broadens the scope to include contexts in which teachers set the task and learners then take charge and organize their resources. Under this definition of learner autonomy, learners are not always expected to determine the learning task. Although both learner autonomy and self-regulated learning address issues of control to varying extents, the possibility of individual learners exercising control over the learning environment is questionable in social settings, such as classrooms. Self-regulation and learner autonomy start to diverge at the point where the self meets the social world. Commenting on the relationship between the self and the social world in regard to learner autonomy, Benson (2013) writes, “autonomous learners are never entirely in control of their language learning….autonomous language learners often find themselves, or willingly place themselves, in situations where they have little direct control over their learning” (p. 87). In both areas of learner autonomy and self-regulated learning, the control learners might have over the learning environment is variable and even doubtful, making it difficult to differentiate between the two constructs on the basis of learner control. In fact, looking at Table 1, it is difficult to identify differences between the two, which would justify their remaining distinctive areas of inquiry. Yet when viewed in the context of the research traditions they grew out of, they seem to be based on different ways of seeing the world or different mindsets. This notion is supported by the fact that learner autonomy and self-regulation have very different points of origin. In their comparison of learner autonomy and self-regulated learning, Lewis and Vialleton (2011) characterize learner autonomy as a person-centred approach, which developed in Europe in the late 1970s with its roots in “liberal and libertarian theories of learning, such as those propounded by Ivan Illich, Paulo Freire, and Jerome Bruner” (p. 206). On the other hand, note Lewis and Vialleton (2011), self-regulated learning is a branch of educational psychology that emerged from research carried out in the 1960s into processes such as self-reinforcement, goal-setting, self-efficacy and self-evaluation, and was informed by social cognitive theory. This would suggest that perhaps we cannot really understand the relationship between learner autonomy and self-regulated learning by doing a discrete point comparison, and should therefore consider the approaches from a broader perspective. Huang and Benson (2013) argue that if we want to understand learner autonomy we need to identify not only its components, but also its dimensions. They then proceed to break down the two key elements of the definition: capacity and control. They see the capacity to control learning as being comprised of three components: 1) ability, which refers to knowledge and skills such as those required to plan, monitor and evaluate learning; 2) desire, which implies motivation, and 3) freedom. They characterize freedom as “the degree to which learners are ‘permitted’ to control their learning, either by specific agents in the learning process” (Huang & Benson, 2013, p. 9) or by features of the learning situation. From my dual perspective as a teacher and researcher working in the area of learner autonomy, I view self-regulated learning as being most clearly associated with the component of ability. There is evidence in the literature of this view being shared by other researchers. For example, in a recent study investigating the effects of strategy-based instruction on the promotion of learner autonomy, Nguyen and Gu (2013) conceptualize learner autonomy as a combination of learner self-initiation, i.e. “volition and willingness to learn” (p. 13), and self-regulation with its focus “on the learner’s strategies and skills of metacognitive self-management, such as planning, monitoring, and evaluating” (p. 13). Benson (2011) also supports this view, noting that research in self-regulated learning can help educators interested in learner autonomy have a better understanding of the cognitive and metacognitive aspects of control over learning. Benson (2011) concludes his discussion of self-regulated learning by stating that “the concept of self-regulation is somewhat narrower than the concept of autonomy” (p. 44). However, Benson’s (2011) comment raises the following question: what basis of comparison might one use in order to conclude that learner autonomy is a broader concept than self-regulation? I would argue that to make such a comparison one needs to broaden the focus on the individual learner – with his or her cognitive, metacognitive, and affective processes – to encompass the learner’s social environment. Therefore, I propose that to better understand the relationship between self-regulation and learner autonomy we need to expand the comparison to the level of the social dimension. This leads me to my second question: What are the social dimensions of learner autonomy and self-regulated learning? Before I address this question, I would like to introduce a study, which has informed this paper. For the past five years my colleagues and I have been carrying out an ethnographic inquiry exploring the language learning opportunities, or affordances, available in a social learning space called the L-Café (formerly the English Café), located on the campus of a large national university in Japan (Murray & Fujishima, 2013; Murray et al., 2014). This study is germane to the present discussion for two reasons: firstly, because it has been a vehicle for alerting my colleagues and myself to the social dimensions of learner autonomy and self-regulation; and secondly, because data from the study will be helpful in illustrating some of the points I will be making. The original idea behind the English Café was to provide a facility where Japanese students could practice their language skills. However, this meant welcoming international students who wanted to improve their Japanese and who brought with them other languages. Hence, the English Café has evolved into the Language Café, or L-Café. As a part of our five-year project to explore the role this facility plays in language learning on campus, we are tracking the language learning trajectories of 13 Japanese EFL learners from their first to fourth year. In our study we are taking an ecological approach (van Lier, 2004) and treating the L-Café as an eco-social system (Lemke, 2002), which we are exploring from different levels or scales. For example, we are looking at the individual students as part of this system, and at the L-Café as nested within larger systems, e.g. the Language Education Center, which is itself nested within the university as an institution. In addition, we are taking different time scales into account, such as individual semesters, the eight-month period during which exchange students frequent the L-Café, and the four-year period required for students to fulfil their degree requirements. In order to consider the affordances for language learning that emerge in this environment, we interview the participants and L-Café workers every six months, do participant observation, and administer questionnaires to all L-Café users once a year. We have been carrying out an ongoing thematic analysis of the data, the results of which I will draw on as I discuss the social dimensions of learner autonomy and self-regulated learning. Because of the strong focus self-regulated learning and learner autonomy have had on the capacities of the individual learner, it is important to establish that there is actually a social dimension to both. A review of the literature reveals that educators working in the areas of learner autonomy and self-regulated learning seem to have been on a parallel path, gradually moving towards increased recognition of their social dimensions. This transformation is in large measure due to the influence of sociocultural approaches in education, stemming from the work of Vygotsky (1978). In the area of learner autonomy, Little (2000) has promoted the notion that learner autonomy can be developed in social contexts, i.e. the language classroom, through interdependence and collaboration. Little was no doubt influenced by the work of Dam (1995) in Denmark who was promoting learner autonomy in her mixed-ability, middle school English classes. Dam required her students to set individual goals, but to achieve them the learners worked collaboratively in small groups. She encouraged her learners to find good learning activities, share them and evaluate them. For Little, Vygotsky’s (1978) zone of proximal development (ZPD) offered an explanation for the connection between autonomy, interdependence and collaboration. The ZPD refers to that metaphorical space between what learners are able to do on their own and what they are able to do through the help of a more knowledgeable or experienced other. By getting help in the present, learners are able to do things on their own later, and, hence, become more autonomous. Bridging the gap between learner autonomy and self-regulated learning, a Finnish scholar well known for his work on experiential learning has this to say: “The tasks that pupils can do on their own are within their area of self-regulation. The development in the zone thus proceeds from other-regulation to self-regulation, towards increased autonomy” (Kohonen, 2010, p. 6). Early conceptualizations of self-regulated learning identified a social component, but the social has been more or less a backdrop against which the “real” learning and individual development took place. For example, Zimmerman’s (1989) early social cognitive model of SRL recognized that learners would need to monitor and adapt to changes in their physical and social environments; nonetheless, the focus was on the learner’s cognitive processes. However, times are changing. As Hadwin and Oshige (2011) note, “emerging perspectives of SRL move beyond Zimmerman’s (1989) earlier conception of social context being a component…toward social being at the core of SRL” (p. 242). In self-regulated learning, the social dimension is currently being explored under the labels of co-regulation and socially shared regulation. Hadwin and Oshige (2011) define co-regulation as “a transitional process in a learner’s acquisition of self-regulated learning, within which learners and others share a common problem-solving plan, and SRL is gradually appropriated by the individual learner through interactions” (p. 247). They add that “typically, co-regulation involves a student and an other (usually a more capable other, such as a more advanced student, peer tutor, and so on) sharing in the regulation of the student’s learning” (p. 247). Hadwin and Oshige (2011) go on to say that “through dialogue and interaction, individuals learn to engage and control their own self-regulatory strategies, evaluations, and processes by observing, requesting, prompting, or experimenting with self-regulation with a supportive other” (p. 248). The processes they are describing appear to be the same as those noted by Little (2000) and Kohonen (2010), which involve work in the ZPD and facilitate the development of learner autonomy in social settings. According to these scholars, becoming an autonomous, self-regulated learner is largely a social process. For example, if they [Japanese students] ask for a spelling check or something like that, you don’t just cross this out, write something else. You always explain, or they ask you, ‘Why is this bad?’ So really, I think that they learn in that way. According to Vygotsky (1978), getting explanations and support from a more knowledgeable other is a way of learning. Learners are getting the help they need within their zone of proximal development and through this experience will be better prepared to act more autonomously and self-regulate their learning in the future. Having examined the role of the social dimension in learner autonomy and self-regulated learning, I would like to look at what this concept might comprise. In the area of learner autonomy, researchers have been turning their attention to the ways in which autonomy is influenced by and/or developed through interaction in social settings; for example, collaborative work in classrooms. Elsewhere, I have suggested that the social dimension of learner autonomy is multifaceted, comprising other dimensions, such as an emotional dimension, a spatial dimension, and a political dimension (Murray, 2014). I would now like to explore these proposed dimensions in relation to learner autonomy and self-regulated learning. From the outset, the emotional dimension has been a component of self-regulated learning models. For example, in Zimmerman’s (1989) early social cognitive model he identifies “covert forms” of self-regulation, which refer to learners observing and adapting thoughts and feelings during the learning process. In his later cyclical model (see Zimmerman, 2013 for a discussion) emotion figures in an early phase of the learning process through “self-motivation” and resurfaces in the “self-reflection” phase through “self-reaction” which focuses on satisfaction or dissatisfaction with one’s performance. In these models, emotions seem to be internal phenomena related to the individual learner’s cognitive and metacognitive processes. However, as Jang and Iddings (2010) note, “self-regulation has been reconceptualized from successful learners’ exemplary qualities to a social process in which learners develop and make use of certain cognitive and social skills oriented toward goal attainment through interactions with their surrounding contexts” (p. 351). Not only are emotions often given expression during interaction in social settings, but it is often social settings that give rise to emotions. Damasio, a neuroscientist, identifies what he refers to as social emotions. He writes, “The social emotions include sympathy, embarrassment, shame, guilt, pride, jealousy, envy, gratitude, admiration, indignation, and contempt” (Damasio, 2003, p. 45). In a later work he notes, “These emotions are indeed triggered in social situations, and they certainly play prominent roles in the life of groups” (Damasio, 2010, p. 125). The role of emotions in social learning settings remains an under-investigated facet of both self-regulated learning and learner autonomy. O’Leary’s model of learner autonomy is important because it recognizes and gives prominence to the social and emotional dimensions. Between Japanese students especially, they often talk like, “I can’t do listening well, my TOEFL score is not good,” and usually the other student gives advice. And it’s the same… “You spend more time, you focus on the learning.” It’s the same, but they repeat so many times. I think they want to be heard, their struggles or their worries or their difficulties. This quote suggests that learners need to be heard and can benefit from sharing the emotional burden and pressures related to language learning. As learner autonomy and self-regulated learning are reconceptualized in order to give greater prominence to the social, researchers will need to look more closely at the emotional dimension. Another area of learner autonomy and self-regulated learning that requires researchers’ attention is the spatial dimension. Shortly after we started the study at the English Café, our participant-observation made it fairly obvious to us that a community was developing. In order to confirm our perceptions, during the interviews we asked participants how they would describe the English Café. They began their answers with, “It’s a place to…” or “It’s a place where…” some action occurs. At first, this seemed a natural way to respond. Of course it was a place! Then the word “place” began to appear in response to other interview questions, and gradually emerged as category in our data coding process. To better understand this concept, we turned to the literature on space and place in the field of human geography (Cresswell 2004; Harvey 1996; Massey 2005; Tuan, 1977) and work on linguistic/semiotic landscapes (Jaworski & Thurlow 2010), a relatively new area of inquiry in the field of applied linguistics. The general consensus amongst theorists in these fields is that place is a social construction. As Carter, Donald and Squires (1993) put it, “place is space to which meaning has been ascribed” (p. ix). Interpreting our data through the lens of this fundamental notion led us to conclude that “how learners imagine a space to be, perceive it, define it, and articulate their understandings transforms a space into a place, determines what they do there, and influences their autonomy” (Murray et al., 2014, p. 81). This idea raises a number of questions that will need to be explored in subsequent inquiries. For example, research into the spatial dimension of learner autonomy will require re-examining of the notion of control. Benson (2011) has characterized autonomy as control over learning management (cf. Holec, 1981), control over cognitive processing (cf. Little, 1991), and control over content. When we consider the spatial dimension, does autonomy equate to control over the learning space or environment? Our study into one social learning space suggests that it does not. When we asked students in the study what they liked about the social learning space, several replied that they could come and go as they pleased. Their response suggests that these students value their autonomy. Our conclusion from this is that in this social learning space autonomy primarily manifests itself as the possibility for learners to exercise their agency within the environment rather than their control over the environment (Murray et al., 2014). In doing so, autonomy acts as an affordance by making learning opportunities possible. Further exploration of the spatial dimension has the potential to shed light on control as a theoretical construct and, thereby, lead us to see learner autonomy and self-regulated learning in new ways. While enhanced theoretical understanding would be a welcome outcome of research focusing on the spatial dimension, we must not overlook the potential benefits for pedagogical practice. On the level of practice, there is a need to explore learning spaces with alternative designs that blend physical and virtual spaces. By way of example, I currently deliver a self-directed learning course in a language laboratory and in a computer room. In both venues, the computer “stations” are fixed to the floor, in rows, with little room to move around. When it is time to discuss or collaborate, learners have great difficulty getting together to form anything that even looks remotely like a group. We need learning spaces that actually facilitate communication and collaboration. Decision-makers and administrators in positions of power and authority will have to be convinced of the necessity of moving away from the classroom model of the late eighteenth and early nineteenth centuries toward models better suited to the twenty-first century. Creating these spaces is going to take imagination, and it is also going to take political will. In contrast to the area of learner autonomy in which there has been discussion of a political dimension (for example, Benson, 1997; Huang & Benson, 2013; Pennycook, 1997; Ushioda, 2008), Martin and McLellan (2008) criticize self-regulation researchers for “selectively ignoring critically important social (including moral and political) dimensions” (p. 444). In view of the current context, one might conclude that self-regulated learning does not have a political dimension, and argue that on this point learner autonomy and self-regulated learning truly part company. However, is it possible to explore the construct of control in a social context without coming up against issues of power? Therefore, a more likely scenario is that the political dimension is present, but under-addressed. Recent work in the area of learner autonomy provides examples of studies in which the political dimension is not explicitly addressed, yet very much an undercurrent. 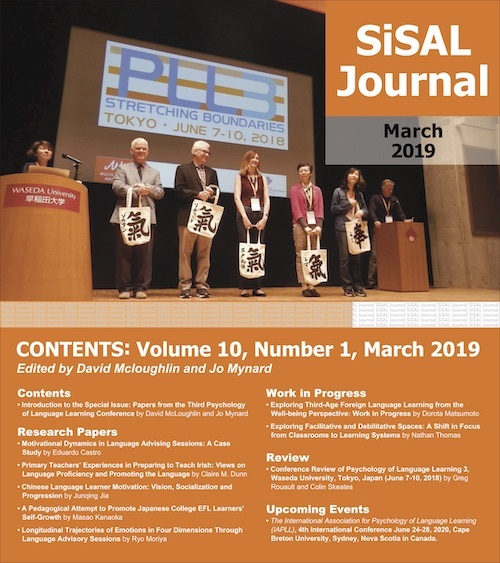 In one such study, Barfield (2014) traces the development of publishing projects in a teachers’ organization, the Japan Association for Language Teaching (JALT) Learner Development Special Interest Group (LD SIG). The underlying theme of the paper is how a group of local teachers managed to break into the world of international publishing; in other words, how teachers doing research or experimenting with ways to provide their learners with alternative learning opportunities had their work recognized and their voices heard by a global audience. A second example comes from Mexico where a researcher has been exploring the relationship between social class and autonomy in self-access language learning (Castillo Zaragoza, 2014). Castillo Zaragoza raises the issue that autonomy may well be a luxury that poor people cannot afford. For one thing, they do not have the range of material resources available to them that more advantaged learners do. However, Palfreyman (2014) reminds us that in addition to material resources there are also discursive resources, the verbalized ideas and beliefs about language learning that circulate in a community. These resources can either encourage or discourage learners from investing in language learning. For example, in Japan, the discourse surrounding globalization and language learning often takes the following form: Japanese students need to learn English in order to take their place in a globalized world. In stark contrast, this is often what the students in my classes tell me: “I don’t really need English. I won’t use English in my daily life in Japan. I will only use English if I go abroad.” There seems to be a disconnect between the highly politicized discourses of globalization and the discourses surrounding language learning that students actually engage in (for related discussions, see Saito, 2014; Taguchi, 2013; Yashima, 2013). Will students who do not see themselves as needing a language invest a lot of time and effort in learning that language? Will students who do not see themselves ever using a language roll up their sleeves and take control of their learning and self-regulate? There is a political dimension at play, and, as language educators, we cannot afford to ignore this dimension in our theory, research or practice (Ushioda, 2008). Addressing the social dimensions of learner autonomy and self-regulated learning has implications for pedagogical practice. In the area of self-regulated learning, a concern has been “whether teachers can adapt their regular classroom activities and assignments to foster increases in their students’ SRL” (Zimmerman, 2008, p. 176). This is another point at which learner autonomy and self-regulated learning diverge. Learner autonomy emerged as a field of inquiry as educators experimented with alternative means of meeting language learners’ needs, most notably in the area of self-access language learning. From the outset, learner autonomy has been closely linked to pedagogical practice. The theoretical discussion in this paper leads to three salient points about pedagogical practice in relation to both areas of inquiry. First and foremost, if our goal is to promote autonomy and self-regulation, we need to engage learners in activities that enable them to develop their autonomy and self-regulate their learning. As Little (2000) notes, “the language learner-user will become gradually more autonomous only through the practice of autonomy” (p. 15). Learners become autonomous and self-regulated by doing. As a part of this process, they need the freedom to personalize their learning and exercise their agency. They should be encouraged to set goals that are meaningful to them and to work with materials and carry out activities they find interesting and appropriate. Opportunities for reflection have to be built into the curriculum in every possible way. As a part of the reflection process, learners need to have opportunities to talk about their learning. It is in small group discussions about learning that educators can begin to address the emotional dimension, and perhaps even the political dimension, by working on discursive resources. In other words, it may be possible to openly discuss beliefs and attitudes prevalent in the community that may support or hinder language learning. One of the benefits of these discussions is that students can realize they are not alone – that other classmates are often feeling and experiencing the same thing. Furthermore, through these discussions they can find the words to express their concerns and questions, which can then be brought to the teacher, if necessary. However, perhaps more importantly, group discussions can provide opportunities for students to learn from each other. My second point is that we need learning spaces that facilitate activities that promote the development of learner autonomy and self-regulation. These learning spaces will need to be equipped with digital and material resources, while at the same time enabling students to move around and work with each other. The creation of these spaces is going to take political will and imagination. My third point is that we need to evoke the imagination: our imagination and our students’ imagination (see Murray, 2013). In self-regulated learning and learner autonomy, educators try to find ways to foster learners’ cognition and metacognition; however, there is a third component that needs to be considered: imagination. In the literature on self-regulation, authors come close to acknowledging the role of imagination. Zimmerman (2013) recognizes the role of mental imagery in his model of SRL and gives examples of using creative visualization as a self-regulatory strategy. As Zimmerman’s work would suggest, the processes of cognition, metacognition and imagination are mutually supportive; therefore, we need to exercise all three in our practice. A starting point for working with cognition, metacognition and imagination is students’ identities. As educators we need to find out who our students are, but, more importantly, we need to get them thinking about who they are, focusing on their identity in general, and, more specifically, on who they are as language learners. Learning is about identity: past, present, future. A first step could be to have students write short life histories focusing on their language learning. Follow-up activities should focus on the development of students’ future selves. At the university level, students are in a compressed phase of metamorphosis. In many cases the transformation is actually visible. As educators, we need to work with that. To this end, another activity might be to have students write anticipated life histories. The prompt might be something like the following: “You are 25 years old and a fluent English speaker. How did you get there? What is your life like? How do you use English?” Work supporting the imagination will have to be sustained in subsequent activities; it is not an activity or a unit that teachers do once in the first class of the semester. Research will be required to determine if these activities are successful in supporting students’ motivation, helping them envision an L2 identity, or steering their discourses surrounding language learning in a positive direction. In general, future research will need to focus more intently on the social dimensions of learner autonomy and self-regulated learning. In their critical review of the literature on self-regulation, Martin and McLellan (2008) conclude that “what is required is a more thorough going recognition of the constitution of minds and selves within social interactivity with others” (p. 443). More specifically, future inquiries might explore the ways in which interaction can foster or impede the development of self-regulation (Bown, 2009) and autonomy in language learners. There is a need to investigate the shift from social regulation to self-regulation. What role does the learning space play in this shift? What roles do emotions and imagination play? In addition, there is growing evidence that we should reconsider the construct of control in relation to learner autonomy and self-regulation. Perhaps we need to find other ways to conceptualize and think about learner autonomy and self-regulated learning. Discussing the learning trajectories of two learners of English as a foreign language, Benson (2013) states that their narratives “pose problems for a view of autonomy as ‘taking charge of one’s own learning’ (Holec, 1981, p. 3), because they show quite clearly that autonomous learners are never entirely in control of their language learning” (p. 87). It should be noted that Holec (1981) explained that to take charge of one’s learning entailed assuming responsibility for all aspects of the learning process from goal setting to assessment. Taking responsibility for one’s learning is not necessarily the same thing as taking control. Citing Bonnett and Cuypers (2003), Benson (2013) explores the notion that “autonomy is essentially a matter of taking responsibility for one’s authentic concerns” (p. 86), i.e. concerns that are of special significance given one’s personal situation. Whether or not learners will be able to express and pursue their authentic concerns, given the constraints imposed in institutional learning spaces, raises the issue of freedom. In the literature on self-regulated learning, the question has been raised as to whether self-regulated learning is concerned with control of the self or control by the self (Martin & McLellan, 2008). Control by the self implies a degree of freedom. Writing from the perspective of self-determination theory, Ryan and Deci (2006) are very clear: “autonomy literally refers to regulation by the self” (p. 1557). As researchers engage in a closer examination of control as the basis of learner autonomy and self-regulated learning, they might focus on constructs such as freedom and responsibility. Research carried out in institutional settings, which entails creating learning environments affording learners greater freedom and encouraging them to accept responsibility for their learning, will be interventionist. Therefore, researchers should consider drawing on approaches that openly acknowledge and discuss their interventionist orientation. For example, they might employ ecological (van Lier, 2004), complexity (Larsen-Freeman & Cameron, 2008) and mediated discourse analysis (Scollon & Wong Scollon, 2004) perspectives. While these approaches do not prescribe specific methodologies, they offer guidelines that encourage researchers to consider the nexus of actions, discourses, and identities, and to take into account the place where these elements intersect as well as the influence of varying time scales. My exploration of the relationship between learner autonomy and self-regulated learning has led me to view them as being two separate areas of inquiry that involve different mindsets. Despite a movement towards social concerns, self-regulated learning research remains primarily concerned with learners’ cognitive processes. On the other hand, I see research into learner autonomy as being situated at the interface of self and social worlds. Clearly, self-regulation research into cognitive and metacognitive processes can provide important insights for educators interested in learner autonomy (Benson, 2011). However, I believe that research agendas exploring cognition and metacognition in language learning should be expanded to include the role of the imagination. Researchers should also question the concept of control in relation to both learner autonomy and self-regulated learning. At present, both areas of inquiry are broadening their research focus and giving more attention to their social dimensions. I contend that these social dimensions are multi-faceted and encompass other dimensions such as the emotional, the spatial, and the political. Research agendas exploring these social dimensions have the potential to provide insights that will broaden theoretical understanding of learner autonomy and self-regulated learning, and over time influence practice. Garold Murray is an associate professor in the Language Education Center at Okayama University, Japan. He has published widely on the subject of autonomy in language learning and is currently pursuing research interests in social learning spaces, the semiotics of place, and imagination in language learning. Barfield, A. (2014). Local engagements enhancing practitioner action and knowledge for learner development and autonomy within a collaborative teachers’ network. In G. Murray (Ed. ), Social dimensions of autonomy in language learning (pp. 211-229). Basingstoke, UK: Palgrave. Benson, P. (1997). The philosophy and politics of learner autonomy. In P. Benson and P. Voller (Eds. ), Autonomy & independence in language learning (pp. 18-34). London, UK: Longman. Benson, P. (2008). Teachers’ and learners’ perspectives on autonomy. In T. Lamb & H. Reinders (Eds. ), Learner and teacher autonomy: Concepts, realities, and responses (pp. 15-32). Amsterdam, Netherlands: John Benjamins. Benson, P. (2013). Drifting in and out of view: Autonomy and the social individual. In P. Benson & L. Cooker (Eds. ), The applied linguistic individual: Sociocultural approaches to identity, agency and autonomy (pp. 75-89). Sheffield, UK: Equinox. Bonnett, M., & Cuypers, S. (2003). Autonomy and authenticity in education. In N. Blake, P. Smeyers, R. Smith, & P. Standish (Eds. ), The Blackwell guide to the philosophy of education (pp. 326-340). London, UK: Blackwell. Castillo Zaragoza, D. (2014). Social class and autonomy: Four case studies in a Mexican SAC. In G. Murray (Ed. ), Social dimensions of autonomy in language learning (pp. 192-210). Basingstoke, UK: Palgrave. Damasio, A. (2003). Looking for Spinoza: Joy, sorrow and the feeling brain. London, UK: Vintage. Damasio, A. (2010). Self comes to mind: Constructing the conscious brain. New York, NY: Pantheon. Hadwin, A., & Oshige, M. (2011). Self-regulation, coregulation, and socially shared regulation: Exploring perspectives of social in self-regulated learning theory. Teachers College Record, 113, 240-264. Jaworski, A., & Thurlow, C. (2010). Introducing semiotic landscapes. In A. Jaworski & C. Thurlow (Eds. ), Semiotic landscapes: Language, image, space (pp. 1-40). London, UK: Continuum. Kohonen, V. (2010). Autonomy, agency and community in FL education: Developing site-based understanding through a university and school partnership. In B. O’Rourke & L. Carson (Eds. ), Language learner autonomy: Policy, curriculum, classroom (pp. 3-28). Oxford, UK: Peter Lang. Little, D. (1991). Learner autonomy: Definitions, issues and problems. Dublin, Ireland: Authentik. Little, D. (2000). Learner autonomy and human interdependence: Some theoretical and practical consequences of a social interactive view of cognition, learning, and language. In B. Sinclair, I. McGrath, & T. Lamb (Eds. ), Learner autonomy, teacher autonomy: Future directions (pp. 15-23). Harlow, UK: Pearson. Murray, G. (2014). Exploring the social dimensions of autonomy in language learning. In G. Murray (Ed. ), Social dimensions of autonomy in language learning (pp. 3-11). Basingstoke, UK: Palgrave. O’Leary, C. (2014). Developing autonomous language learners in HE: A social constructivist perspective. In G. Murray (Ed. ), Social dimensions of autonomy in language learning (pp. 15-36). Basingstoke, UK: Palgrave. Palfreyman, D. (2014). The ecology of learner autonomy. In G. Murray (Ed. ), Social dimensions of autonomy in language learning (pp. 175-191). Basingstoke, UK: Palgrave. Pennycook, A. (1997). Cultural alternatives and autonomy. In P. Benson and P. Voller (Eds. ), Autonomy & independence in language learning (pp. 34-53). London, UK: Longman. Scollon, R., & Wong Scollon, S. (2004). Nexus analysis: Discourse and the emerging internet. New York, NY: Routledge. Taguchi, T. (2013). Motivation, attitudes and selves in the Japanese context: A mixed methods approach. In M. T. Apple, D. Da Silva, & T. Fellner (Eds. ), Language learning motivation in Japan (pp. 169-188). Bristol, UK: Multilingual Matters. Tuan, Y-F. (1977). Space and place: The perspective of experience. Minneapolis, MN: University of Minnesota Press. Ushioda, E. (2007). Motivation, autonomy and sociocultural theory. In P. Benson (Ed. ), Learner autonomy: Teacher and learner perspectives (pp. 5-24). Dublin, Ireland: Authentik. Yashima, T. (2013). Imagined L2 selves and motivation for intercultural communication. In M. T. Apple, D. Da Silva, & T. Fellner (Eds. ), Language learning motivation in Japan (pp. 35-53). Bristol, UK: Multilingual Matters.